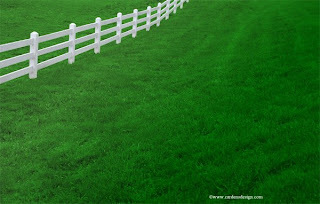 I don't know about your mother and grandmother, but every time I got to the point where I started to envy what someone else had versus what I had they said "The grass is always greener on the other side of the fence". I always remember thinking "Well what the hell does that mean? "Does it mean you are going to get me the thing I want or not? I eventually came to understand that it meant no I was not getting anything. However, recently I have begun to understand that concept very clearly. Thank God for me that my understanding of this concept has come from watching... from the other side of the fence. Recently I have heard from a friend that another friend of mine was trying to use my life as the measuring stick. She was trying to holding her relationship dealings with her NEW step children up to mine. Essentially she was trying to say "look at the relationship that Jenn has with her step kids... I want it to be like that." Apparently my grass looks pretty from where she is standing. Well, right now it is pretty, but she chooses to forget all of the watering and mowing and fertilizing that I have been doing for the past 10 years to make it so green. It is green because of financial sacrifice, tear filled discussions, and hard work. But she does not really feel like she should go through all that. She just wants an insta happy family, but "it don't work like that honey". Next on my list is her significant other. Long story short, it seems he left his wife, not because of my friend, but because I think he had decided that he wanted to be in a different type of relationship, with a different kind of woman. He was married to what seems from my perspective to be a successful woman. A woman that I imagine ran most of the details of the house, maintained her own financial stability, and probably demanded a level of respect from him that he did not want to part with. I am sure there was some hurt and pain that took place on both sides of that marriage, so I expect that his vision of a perfect woman became one that was the polar opposite of what she was... a woman who was not so career focused, or demanding. His new dream girl would be willing to stay home and take care of the house and children, forgoing her own personal goals for the support of his goals. He went searching beyond the fence for his greener pastures, and there she was... my friend. What I think he did not bank on was that on this new pasture, 100% of the burden rests on him. She is not working... at his request, and now that the baby is here, she does not really want to go back to work... but she is still being asked to pay a portion of the bills out of her savings. I wonder what will happen when her savings runs out? Also, she needs him for everything, her sun rises and sets on his every word... just like what he thought he wanted. So I hope if you are in a place in your life where you are unhappy, and you are looking over the fence into someone else's yard. So work on your own yard... run your own race... and just look for the joy in your own life. Most likely there is someone looking over the fence at your raggedy brownish green grass too.